We are a T-Shirt Printing Machine Manufacturer, Supplier and Exporter in Haryana, India. We utilize advanced techniques to fabricate T-Shirt Printing Machine. Our range of T-Shirt Printing Machine is designed for varied fabrics of diverse widths. The T-Shirt Printing Machines have high printing speed that ensures maximum productivity. 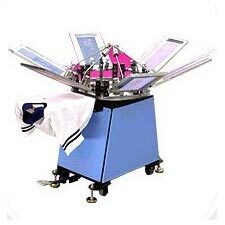 We offer these T-Shirt Printing Machines in different sizes & capacities, at highly competitive prices. High Production rate 80 T-shirts/hour depending upon skill of operator. Easy frame installation and removal. Warped screen adjustment : This practical feature allows you to easily position each screen flat to your shirt board. Improving consistency of quality and reducing down time.